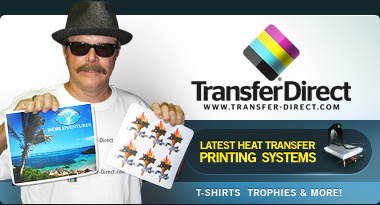 Become a total solution printer with the Transfer-Direct system that enables: Heat transfer, Full Color printing on white, light, black and dark fabrics without any dilution – what you see on the screen is what you get with Image Resolution up to 2400 dpi. Printing on Acrylic, Cardboard, Plastic, Metal, Ceramic, Leather, Glass, water-release Decal Film and more. A system that enables short-run and special projects to remain in house with no minimum quantities to cover the set-up cost. 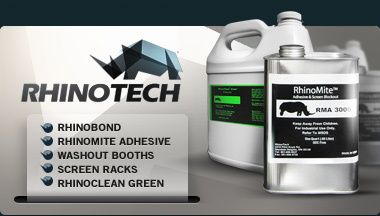 RhinoClean Green²; Instant and Two-Part Adhesives, RhinoBond and RhinoMite Frame Adhesives, Primer, Screen Prep, Screen Wash, Emulsion, Emulsion Remover, Degreaser, Press Wash, Blockout, Haze Remover and Hand Cleaner. Choose from Starter Shop - Professional Shop Set-Up packages. All Prices are subject to change without notice. There are no Grandfather clauses. Prices do not include shipping charges. Prices are listed in US Dollars.